Sometimes there is nothing like listening to a band whose sound harkens back to an earlier era, and Lucifer is just that band. Formed in June of 2014, this four-piece draws its inspiration from such music pioneers as Led Zeppelin, Black Sabbath, and Deep Purple. The band consists of Johanna Sadonis (vocals), Gaz Jennings (guitar), Dino Gollnick (bass), and Andrew Prestridge (drums). They sure do gel for such a short time together and the results are very good. 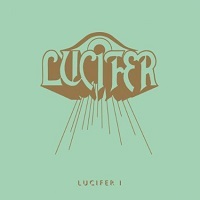 Lucifer, I is their debut album and it is a strong presentation. With eight songs that run just under three quarters of an hour, Lucifer, I is a carefully crafted work of art that uses all of its time in a purposeful manner. It is clear that their creative and musical juices were flowing when they embarked on this project. The sound of Lucifer, I is nothing short of heavy and energetic, with more than its hints of darkness. There is an ominous atmosphere that pervades the album, the type that sends one fleeing inside and latching up the door as something evil rolls into town. The brilliant opener, “Abracadabra,” dazzles with its deep, rich sound and its dark atmosphere that sets the tone for the rest of the album. At the forefront, though, are the amazing vocals that just steal the show. They are haunting and powerful, and are the perfect fit for Lucifer’s dark and heavy sound. “Sabbath” is heavy, dark, and saturated with gothic atmosphere. Getting off to a slow and foreboding start, “White Mountain” does not stay so languid long before the drums and guitar ramp it up for a kicking and animated sound. “Morning Star” is probably the most memorable and thrilling song on the album. The sound is as heavy and dark as can be. The vocals are stellar, full of passion and anguish, but the guitar is the main attraction here. They are prominent from the beginning and absolutely unleash in the second part of the song. The doom and gloom of “Total Eclipse” make it a nice candidate for Hell’s soundtrack, if it had one. “A Grave for Each One of Us” is a strong closer. The guitar has a nice groove to it, the vocals are alluring and crisp, and the sound is crushing and heavy. Lucifer’s Lucifer, I is a triumphant debut album, making Lucifer a band to keep an eye on, as they grow in the years to come. They have produced a very economical album without a wasteful song, and they exude a confidence and a cohesion of a band that has been together longer than a year. If you are into doom metal or the heavy metal sound of the seventies, then you will want to check this album out.